50 Hertz (Hz) means the rotor of the generator turns 50 cycles per second, the current changes 50 times per second back and forth, direction changes 100 times. That means the voltage changes from positive to negative, and from negative to positive voltage, this process converts 50 times/second. The electricity 380V AC and 220V AC, are both 50 Hz frequencies. 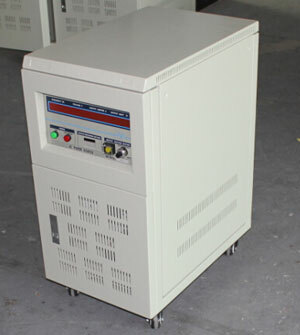 The speed of 50 Hertz 2 poles synchronous generator is 3000rpm. AC power frequency is determined by the pole number of the generator p and speed n, Hz = p*n/120. The grid standard frequency is 50Hz, which is a constant value. For a 2-pole motor, the speed n = 50 * 120 / 2 = 3000rpm; for a 4-pole motor, the speed n = 50 * 120 / 4 = 1500rpm. When the frequency increases, the copper and steel consumptions of the generator and transformer decrease, along with the reduction of weight and cost, but will make the inductances of the electrical equipment and transmission line increase, reduce the capacitances and increase losses, thereby reduce the transmission efficiency. If the frequency is too low, the electrical equipment's materials will increase, along with heavy and high cost, and will make lights flashing obviously. Practices have proved using 50Hz, 60Hz frequencies are appropriate. Can a 50 Hertz motor run on 60 Hertz? Since the formula for governing the synchronous speed of a three-phase motor is n = (120 * Hz)/p if this is a 4-pole motor then at 50 Hertz the speed would be 1500 RPM whereas at 60 Hertz the speed would be 1800 RPM. Since motors are constant torque machines then by applying the formula that HP = (torque*n)/5252 then you can see that with a 20% increase in speed the motor would also then be able to produce 20% more horsepower. The motor would be able to produce rated torque at both 50/60 Hertz frequencies only apply if the V/Hz ratio is constant, meaning that at 50Hz the supply voltage would need to be 380V and at 60Hz the supply voltage would need to be 460V. In both cases the V/Hz ratio is 7.6V/Hz. I used to set a 50 Hz three phase motor to run on 60 Hz power supply many times per year, using frequency converters capable of full motor speed regulation. Use a 20% factor across the board in the programming. For example, a motor at 1 hp, 50 Hz, 400V AC, set the motor Hertz in the frequency converter to 60Hz, then the motor voltage to 480V AC. This will increase the motor output to approx. 1.2 hp, with a corresponding increase in torque. Setting the motor speed (RPM) using the 20% factor is also essential. For example, if the motor speed at 50 Hertz is 1,400 RPM, dividing the RPM total by 0.8, results in a quotient of 1,750 RPM. By affording this balance of the Volts/Hz/RPM ratio, the motor design criteria is very closely matched in the conversion. Where is 50 Hertz being used? Why use a 50 Hertz to 60 Hertz Converter? Case 1: When you travel or move from one country (50 Hertz, e.g. UK, UAE, Malaysia) to another (60 Hertz, e.g. USA, Philippines, Peru), and bring some 50 Hertz electric appliances which are not compatible with running on 60 Hertz, or sometimes we just buy a device which is only available for 50 Hertz power system, in such cases, we need a 50 Hertz to 60 Hertz frequency converter to convert Hertz (or vice). Case 2: Some multination enterprises make electrical home appliances, industrial machines outside the selling market countries, e.g. a Canada enterprise making an electric device in India (50 Hertz) and tend to sell the products in USA, Canada (60 Hertz), or a Australia (50 Hertz) enterprise exports electrical appliances to US, Philippines, the company will need a 50 Hertz to 60 Hertz converter (or 60 Hertz to 50 Hertz) to test the appliances' operation compatibility under expected Hertz. Three phase frequency converters, generally for industrial equipments.